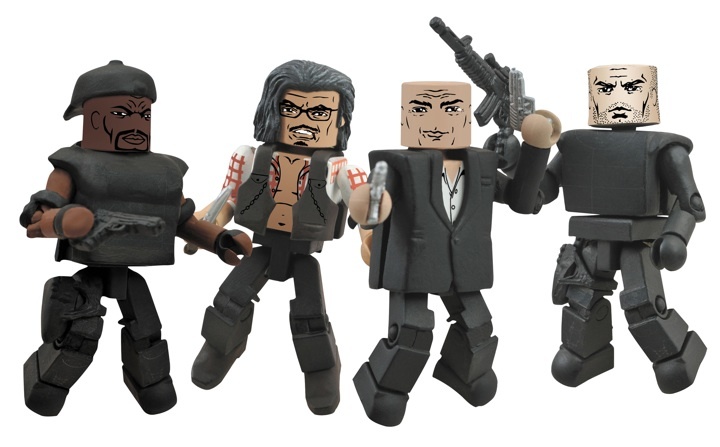 Diamond Select Toys and Art Asylum have unveiled new Minimates based on characters from the Expendables. On-screen, the stars of the instant-classic action film The Expendables are all larger-than-life, but in the real world, many of them are no bigger than you or me. Jason Statham? Five-foot-nine. Sylvester Stallone? Five-foot-nine-and-a-half. Jet Li? Five-foot-six-and-a-quarter. So translating all of them into 2-inch Minimates minifigures was a piece of cake! Read on for more info and the images. 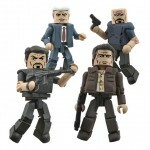 Each set will come packed to the rafters with weaponry, with a dozen guns in each 4-pack, plus various knives and batons. As a bonus, DST will release two more sets based on Expendables 2 when the sequel hits theaters on August 17! Haven’t seen the first Expendables? Rent it tonight, and find out more about the characters below! The leader of the Expendables, an elite team of mercenaries, Ross is offered a mission to depose the dictator of the island nation of Vilena, but quickly realizes that the situation is more complicated than he was led to believe. An old comrade-in-arms of Ross, Mauser is also called in to bid on the Vilena job, but he turns it down. He claims to be busy, but he also notes that only an idiot would take on General Garza’s personal army. The American Munroe, a former CIA agent, secretly controls the island of Vilena, giving orders to General Garza. The CIA wants him taken care of, but they need to hire an independent contractor to do the job. Munroe’s ruthless right-hand man, Paine lives up to his name in a fight, with his overwhelming strength and brutal combat style inflicting maximum damage. He also seems to be entirely comfortable with torture. Highly skilled in all bladed weapons, Lee Christmas can hit a bulls-eye at 50 paces, an ability that comes in handy on covert missions. But troubles at home may cause him to lose his cool before the mission even starts. The team’s weapons expert can talk at length about his favorite model of shotgun, and always has an arsenal at the ready, but he’s also incredibly strong, and is equally deadly with or without a gun in his hand. Tool is no longer an active member of the team, but he still acts as mission coordinator from the comfort of his New Orleans tattoo parlor. He’s also an expert knife-thrower, and Lee Christmas is constantly testing his skills.